In the wake of the Supreme Court’s ruling making Gay Marriage in a civil setting lawful, conservatives and conservative Evangelical Christians fears that the decision will take away religious liberty and that of free speech are totally unfounded. None of the plaintiffs in the case sought relief so they might require churches to endorse gay anything. Religious sects may exclude on whatever religious belief they wish. And they may go into public squares and places where civic engagement is practiced, and in the media, and say whatever they wish. The ability to express your opinion publicly and privately is fully supported by the First Amendment to the Constitution of the United States. Unless you own a media outlet, you don’t have the right to expect your opinion to be fully reported to those who consume those ideas. Your ability to establish a media outlet or outlets to get that opinion across is fully protected under that same First Amendment and its free speech provision. The government cannot make any law that infringes on matters of religion. If I say that I support ISIS in public (I do not) or that I believe gays will go to hell, or any utterance that may be unpopular or repulsive, such as Donald Trump’s firm belief Latino immigrants are all rapists and criminals is protected speech. The mere expression of thoughts and utterances are always protected speech and personal religious belief as well as that of religious sects, are fully out of bounds to any interference from government at any level in the United States of America. No one can discriminate or cause you physical harm over these things. It comes under long accepted First Amendment protections. End of debate. It is a fact. Let us see where these same things become unprotected expressions of free speech or religion. If someone publicly supports ISIS AND they begin to actively plot terror against others, or the nation, or try to go to the Middle East to join up with ISIS it is not protected at all. In fact, these things are patently illegal in this country and criminal.. If I say I believe in criminality I can say that under the First Amendment. But if I actively plan to rob a bank with others, and get caught, then that comes under a statutory criminal offense. Our best thought on this legal question of how far does our liberty go was answered expertly by former Chief Justice of the U.S. Supreme Court Oliver Wendell Holmes Jr. He said in a court decision our liberty ends where it strikes someone else’s liberty. A person has the right to swing his fist until it reaches the nose of someone else. Merely saying you are against gay marriage, and why you are, is not subject to restriction by the government, nor may those who disagree with you exclude you from common public and civic engagement merely because what you say is commonly objectionable to many or most people. What you cannot control however, is the reaction of other people to an idea intellectually, or how they may express speech toward you. If a lot of people tell Donald Trump he is a bigot or conservative Christians or white Southerners who love and show the Confederate flag they are too, they have a right to think or say it via free speech. When we attach actions that discriminate against your liberty or expose you to any unequal protection of our laws you’re firmly in the right. When people demand that to be free their ideas must be accepted more than someone else they err seriously. This is precisely what we are seeing as an anti-gay backlash sweeps the nation. Just a generation ago people supporting gay marriage would have been shouted down. They would be excluded from the company of most people, and face such hostility to the idea. Their coming out and expressing the right to civil gay marriage was and remains a huge act of courage. Until recently in Britain they would be jailed. But now something like just over half of the American people (56% in a recent professionally conducted poll) support a person’s right to have their civic gay marriage made legal. And the U.S. Supreme Court by majority agreed. This was a 14th Amendment case bearing on all Americans right to the equal protection of our laws; equal treatment under law in common parlance. John Stuart Mill, an English philosopher and writer of the classic work On Liberty and in those going back in the western world to John Milton specifically shared Justice Holmes’ definition of religious and free speech and its limits. People opposed to gay marriage do NOT have the right to deny the liberty of others merely for what they believe, or if the government constitutionally renders a decision as the Supreme Law of the Land. Resistance to that is unlawful. Those resisting must expect to lose in court and to receive fines or imprisonment on any civil rights violation. In the Hobby Lobby case the court decided that employers could discriminate against women seeking legal pregnancy protection as a health benefit of their employment. Here it was the power of the employer over the power of the employee. Yet were Hobby Lobby, or say, Chic Filet to refuse service to women on contraception or to gay people, that action extends beyond mere speech or religious belief. These are public businesses open to all people. Way back in 1871 the Supreme Court said in Munn v. Illinois that businesses were “clothed in the public interest.” Government could regulate them and they had certain responsibilities to treat customers equally– to be open to customers in communities across the nation. Businesses that are for profit and those who even in some cases may be not for profit have no license to discriminate against their customers or clients. If you do not wish to invite a gay person to your home, or associate with them personally, or to be a member of your church, it does not come into play. You’re safe. You just might not have any gay friends either. But the 14th Amendment and the Civil Rights Act of 1964 DOES come into play if say a public for profit business discriminates against racial and ethnic minorities, or religious sects who merely wish to be customers. Sadly, at present it is legal to discriminate against the LGBT community in employment, and in areas outside the court’s decision. It does not make it right. And it does not affect your real legal liberty if a lot of people condemn you for it using their speech. Discriminating against gay people in your actions is deplorable; it is patently against the equal protection clause of the 14th Amendment and the Civil Rights Act of 1964. 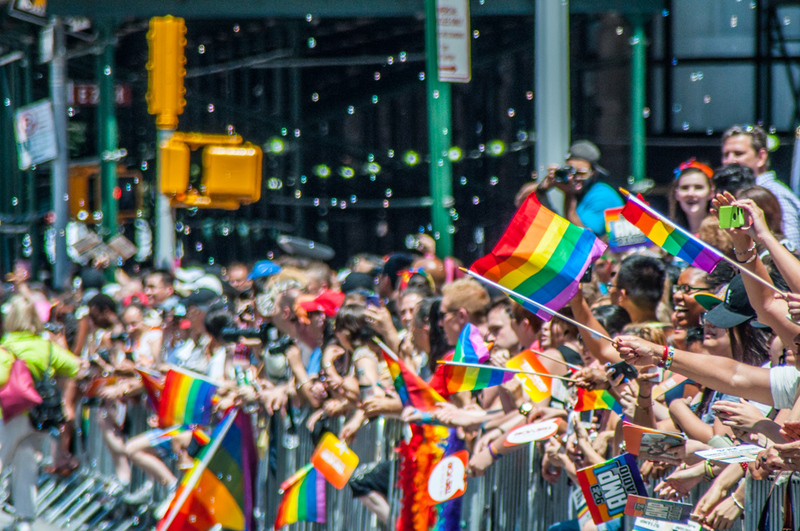 Only in this case, the Congress has yet to legislate a formal ban on discrimination against Americans who are perceived to be, or actually are gay, lesbian, or transgender. And there is still no Supreme Court test of the idea that 14th Amendment protection should be extended this way. It is the strong conviction of this writer that it is immoral to permit the State or Federal Government to discriminate against LGBT persons merely because they are part of the LGBT community, or other entities just because someone is gay or transgender, have that status as persons. And those who actively discriminate or say hateful things to others merely because they want to can legally do it but they are being equally and deplorably immoral. However, if an American citizen merely expresses an anti-gay opinion as free speech or religious conviction, I will immediately rise to their defense under the First Amendment. I may be offended by their speech, but I want my speech, that some may find offensive, protected too. In addition, I am loath to judge the personal character of others merely because I disagree agree with an idea or ideas they hold. My faith teaches me not to judge lest I be judged. Saying someone who opposes the recent Supreme Court decision automatically is a bigot applies to individuals and not groups in my thinking. And I cannot know merely because they have expressed an opinion. I’ll look to their actions as a means of knowing them. It is exactly how I feel about those who love and support the public flying and display of the Confederate flag. There are indeed a good many white Southerners who want it to stay in public places. Many are either furtively, or actually real bigots. But let’s not judge the people of this Southern section of our great nation so prematurely. I do indeed have loving friends who like the Confederate flag. I’ve got many more friends who do not. I totally reject it. Were someone to actively intimidate blacks using that flag (the KKK of today still does) or to harm others while using it, well you are a bigot deserving condemnation and those actions may be criminal. Most religious conservatives and conservative Christians do not wish to discriminate at all. They merely want to hold on to their well-considered religious views of their sect, and to simply be allowed to think and express those views. They can’t expect a warm welcome from everybody on this point, however. Personal religious liberty or personal liberty ought not extend to actively interfering with the liberty, or human rights of others, or that which simply is what someone is from birth. People simply have a right to live unfettered for who they are. This attempt to gain legal and collective liberty to demean and harm others lends no credit or sanction to that behavior. Too much of the Republican Conservative and religious opposition is really an effort to shame and to harm gay people. It is not interference with their free speech or the tenants of their faith. Don’t you let them get away with it. Too many know full well they are not the oppressed minority, who are persecuted and denied equal protection. They have always had that and still do. This entry was posted in Community and Citizen Action, Gender, It's About Struggles for Justice, National Affairs and tagged Conservative Evangelical Christians. Oliver Wendell Holmes and limits of liberty, legalizing gay marriage, Personal Liberty, REligious LIberty, Repubulican Conservatives. Bookmark the permalink.